All summer long it happened every day at Edwards School Playground on Chicago’s Southwest Side. The grounder would stick in the shortstop’s glove, he’d whirl and fire to the pitcher — pitcher’s hands “out” — for the third out before the batter could step on first base, an old newspaper with the rock on top (so it wouldn’t blow away). The four-five-six guys in the field would run in for their turn at bat, and the team that had been batting took the field. Inevitably somebody from the team in the field flipped his glove to one of the guys who didn’t have a glove. That was baseball — and still is — in the free-of-all-cares world of kids and summer vacation, and it’s what makes “A Glove of Their Own” more than just a nostalgia piece, although the first few paragraphs above are evidence that it certainly is that. As good a growth- and person-building experience as organized sports can be when caring, trained, thoughtful coaches and supportive parents make them so, there’s a special growing up that happens in pick up games — games umpired not by adults but by children’s sense of fair play, games not pressurized by league standings or playoffs, games in which kids don’t have to “make the team” but just show up in order to get to play. This colorful, child-sized book won’t win any awards for plot, although it’s cute enough. It won’t take a Newberry Award for creative writing. Details in some of the illustrations will make the trained-eyed sports person wince: The hands of the batter separated on the bat? YIKES! The first baseman standing right in the middle of the base and the runner headed straight into him? Quick, dial 911! But youngsters in the primary grades who like sports will love the story and its rhyming cadences. 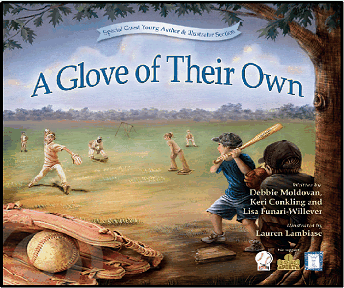 And the messages in this short, simple child’s book are sure to sew seeds of generosity and caring for those less fortunate, like youngsters who have to play baseball without a glove of their own. P.S. — Franklin Mason Press, the publisher, has partnered with Danjulie Associates in a nonprofit effort to raise funds for sports equipment for needy youth. A portion of book sales are donated to selected youth sports organizations, and the company also will partner with groups to do book-selling fundraisers. For details, visit http://www.franklinmasonpress.org. And kudos to Jack Hannahan and Robb Quinlan, two Minnesota Catholic high school products, for their support of this worthwhile project.